Crystal Palace secured Premier League survival and a club-record equalling fifth straight top-flight win as a Mile Jedinak penalty saw off West Ham. The Eagles had a penalty appeal turned down after the ball hit Kevin Nolan's shoulder, but almost fell behind to Andy Carroll's header before the break. Carroll fluffed a good chance and West Ham paid the price when Pablo Armero tripped Cameron Jerome in the box. Jedinak converted and Joe Cole shot wide as a poor West Ham came up short. At the final whistle the Palace players and the noisy travelling fans celebrated a result that matches their record of five successive top-flight wins in the 1992-93 campaign and ensures they will continue in the Premier League for another season at least. West Ham, by contrast, departed to jeers after their direct approach failed to unlock Palace's committed defence. With seven points and six places separating West Ham from the drop, manager Sam Allardyce seems to have done enough to avoid relegation but is still far from winning over the home crowd. Both sets of fans were united before kick-off as they paid tribute to Hammers' striker Dylan Tombides, who died earlier this week at the age of 20, with a minute's applause. The Australian's father Jim and brother Taylor laid his number 38 shirt on the centre spot during the commemorations. The number will be retired in his memory making him only the second player - after the legendary Bobby Moore - to be remembered in such a way by the club. Crystal Palace last run of five top-flight began on 5 December 1992 with a 2-0 home win over Sheffield United and finished with a 1-0 away victory over Middlesbrough. Their run of good form could not save them from the drop. They finished 20th in the 22-team top-flight in the final relegation position. Clear-cut chances were rare once the action got under way with Carroll clearing Kagisho Dikgacoi's header before the visitors' appeals for a penalty were turned down despite Nolan appeared to lean a shoulder into Adrian Mariappa's shot. Scott Dann and Damien Delaney had initially marshalled Carroll well at the other end but West Ham's barrage of crosses almost produced a goal as the striker's muscular header brought a good save from Julian Speroni. That demonstrated the threat that Carroll carries against even the best-organised defence, but his fluffed near-post finish after the break will not have helped his chances of making England's World Cup squad. Shortly after that Armero needlessly fouled Jerome and Jedinak responded to goalkeeper Adrian's attempts to distract him by rifling the spot kick into the top left-hand corner. Allardyce's decision to bring on Carlton Cole for Matt Jarvis as West Ham struggled to force their way back into the game prompted chants of "you don't know what you're doing" from sections of the home support. The change made little impression beyond a hopeful and unsuccessful late penalty appeal from Cole and the action played out with Palace's fans singing the praises of boss Tony Pulis as the Hammers joined Chelsea and Everton as victims of their latest run. Match ends, West Ham United 0, Crystal Palace 1. 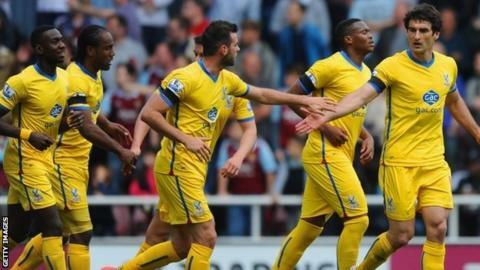 Second Half ends, West Ham United 0, Crystal Palace 1. Foul by Kagisho Dikgacoi (Crystal Palace). Glenn Murray (Crystal Palace) is shown the yellow card for hand ball. Hand ball by Glenn Murray (Crystal Palace). Substitution, Crystal Palace. Daniel Gabbidon replaces Jason Puncheon. Attempt missed. Joe Cole (West Ham United) left footed shot from the centre of the box is too high. Assisted by Carlton Cole with a headed pass. Corner, Crystal Palace. Conceded by James Tomkins. Attempt missed. Joe Cole (West Ham United) right footed shot from outside the box is close, but misses to the right. Assisted by Mark Noble. Mohamed Diamé (West Ham United) wins a free kick in the attacking half. Corner, Crystal Palace. Conceded by George McCartney. Attempt blocked. Yannick Bolasie (Crystal Palace) left footed shot from the left side of the box is blocked. Assisted by Cameron Jerome. Attempt missed. James Tomkins (West Ham United) right footed shot from the centre of the box misses to the left. Assisted by Carlton Cole with a headed pass following a set piece situation. Mohamed Diamé (West Ham United) wins a free kick on the right wing. Attempt blocked. Jason Puncheon (Crystal Palace) left footed shot from the centre of the box is blocked. Attempt missed. Joe Ledley (Crystal Palace) left footed shot from the left side of the box misses to the right. Assisted by Joel Ward. Attempt blocked. Jason Puncheon (Crystal Palace) left footed shot from the centre of the box is blocked. Assisted by Yannick Bolasie. Attempt missed. Yannick Bolasie (Crystal Palace) right footed shot from the centre of the box is high and wide to the right. Assisted by Cameron Jerome with a cross. Corner, West Ham United. Conceded by Cameron Jerome. Attempt blocked. Stewart Downing (West Ham United) right footed shot from the left side of the box is blocked. Assisted by Kevin Nolan.